Landro's Lil' XT is a super-common loot card found within booster packs of the WoW TCG Worldbreaker expansion set. Landro's Lil' XT awards a near exact goblin replica of the Lil XT non-combat pet. The only known difference between the two is a subtle color variation. 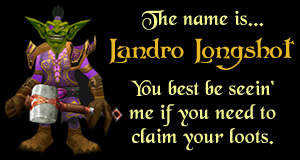 Landro's Lil' XT is a superior quality pet and counts towards all pet collecting achievements. Landro's Lil' XT is a super-common loot card, found in 1 out of 11 booster packs from WoW TCG Worldbreaker. Booster packs of Worldbreaker typically go for around $2.50 each, which means you could end up paying upwards of $27 for this loot card, were you to try and pull it from a pack.